Lunch is usually the toughest meal to cover as you are often at work, or busy, or out and about. This is a real simple dish that you can always fall back on. Cook it quickly at lunch time, or if you aren't going to be anywhere where you can cook, make it up in the morning and pack it in a container and take it with you. 1. Place the chicken thigh fillet in a small container with a splash of olive oil and sprinkle the amount of cajun spices you like. 2. Close the container lid and leave for 10 minutes to soak. 5. Put your fry pan on a medium/high heat and bring to temperature. 6. Place the chicken thigh fillet into the frypan and tip the rest of the juices over top. 8. 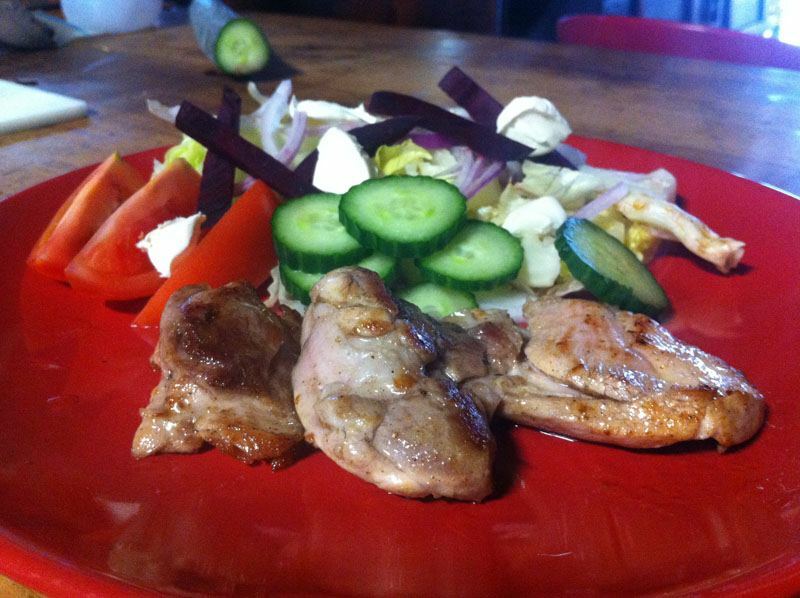 Serve the chicken thigh fillet with the salad. I use Chicken Thigh Fillet for 2 reasons. Firstly they are tastier than breast fillets because they have more fat (yum... fat :)) and secondly they are usually cheaper than breast fillets. If you work in an office or are going to be somewhere that has a sandwich press, you can use this to cook the chicken. Just prepare the salad and oil/spice marinade in the morning and take it with you.